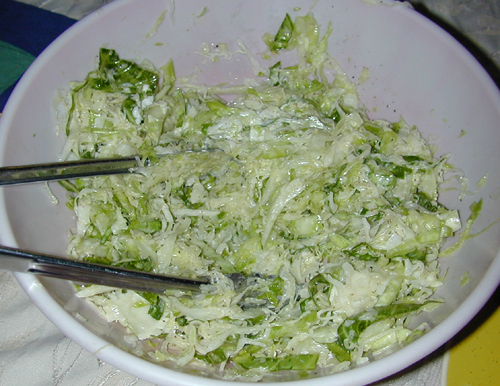 Coleslaw is basically raw shredded cabbage, with or without some other vegetables, in a creamy and/or tangy dressing. I usually make it from green and red cabbage and carrot, in a mayo/mustard vinegrette. Comes out very pretty. 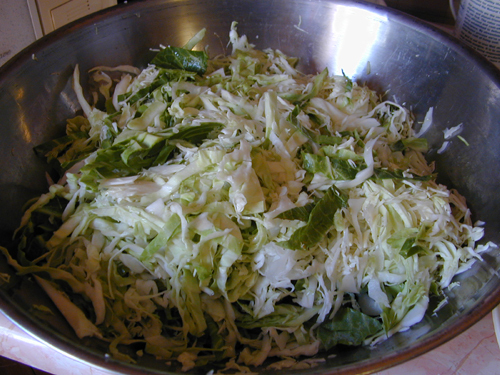 How you cut the cabbage makes an enormous difference. I have in the past used the shredder attachment of my food processer, but that makes a dense slaw without the right texture. It was much better sliced on a box grater. I used the slicing side for as much as I could and the coarse grating side for the end pieces and the carrot. You can also slice by hand, which I did for leaves that fell off, but it’s hard to get them thin enough. The superior tool though is a mandoline. You get ultra-thin but long pieces. The shreds in this picture are wider than usual, but this was a different kind of cabbage and the ones on top were mostly handsliced. Grate cabbage very finely, but in long strands, not a fine dice. You can use shredded cabbage from bags if you prefer. I usually shred 1 green cabbage, 1 red cabbage, and 2 large carrots. This makes a lot of coleslaw. You can make a very nice amount with 1/4 each red and green cabbage and 1/2 carrot. Add good quality extra virgin olive oil to the cabbage, enough to coat all pieces lightly. Around 1/2 cup. Add not quite as much apple cider vinegar as you did olive oil. 1/4 cup or more. Add several big squirts (3-4 tablespoons) of good brown mustard. Don’t use yellow stuff! I like Annie’s Horseradish Mustard, Whole Food’s German Mustard, and others like that. Mix well then taste and adjust! My amounts are just guesses. The amount you will use will depend on the ingredients (they’re different each time) and your personal taste. Add mayonnaise (I use Vegenaise, but any good quality mayo is fine). Anywhere from 3 tablespoons to 1/2 cup, depending on how creamy you want it. Put in fridge. It is best the next day but you can eat it anytime, cold or room temperature. 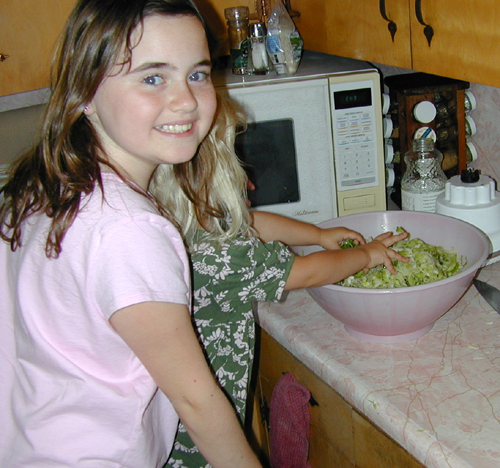 When I made cole slaw for these pictures, I used just green cabbage, an unusual variety from a local farm. I also decided to try a method from Good Eats (on the Food Network) where you salt the cabbage after shredding and let it sit for an hour or so, then squeeze out and discard the excess liquid. It was different from my usual slaw but still good. Miriam’s Trip Blog: We’re Doing Lots of Hiking!